To add another line to the list of lessons we could learn from our Euro counterparts, we must note that they really know how to feast! Yep, we’re totally guilty of whisking through our meals like little Energizer bunnies and right through to the next meeting, meanwhile those across the world are leisurely still chomping on their second course. Sure, it sounds outlandish, but you, too, could celebrate the art of lunching — French style. We're talking about treating yourself (or your work pals) to some mid-day culture with a delicatessen delivery, by a French hottie no less…oh la la is right. 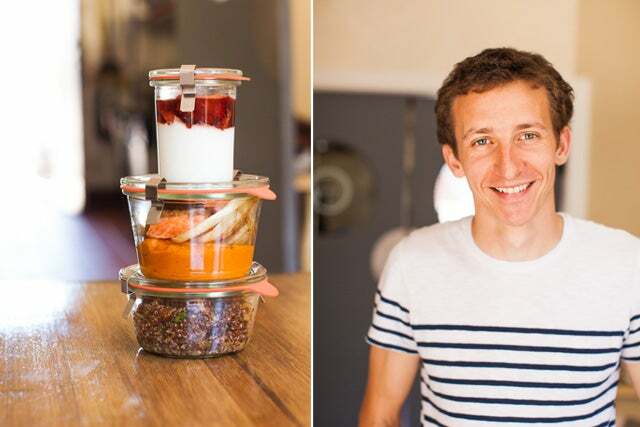 Max Pouvreau and his cutesy catering company Petit Pot will hand-deliver your three-course meal all packed up in the chicest of reusable glass jars. It already sounds better than any meal you've ever had, but lest us forget to mention that Pouvreau never delivers sans his classically French breton-stripe shirt! You can order online from Petit Pot's own website or your favorite local-delivery service, Good Eggs. One last thing, now that you're a creature of French culture: It's no longer lunch, it's dejeuner!